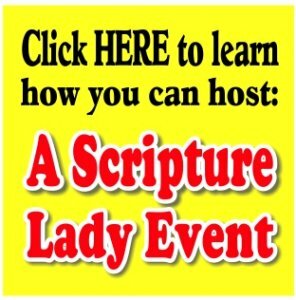 Invite the Scripture Lady to present her preschool Bible song program “God Made Me Special” – a fun Scripture-filled musical presentation for young hearts. It is never too early to tell your young children that it is God who made them. And not only did God create them and give them life, but He made each and every one very special! Teaching Point #1: God made us special by giving each of us talents or activities we are really good at. Bible Skit/Game: “The Telephone Skit” – Next, your preschoolers will be taught that God has given talents to different community helpers in their neighborhoods such as the policeman, doctor and teacher. Through a clever and creative Power Point presentation, the children are invited to guess who the community helper is as they see picture clues. After guessing the correct helper, the telephone rings and they receive a “call” from each neighbor. Teaching Point #2: The second way that God has made us special is by giving us His strength. Bible Verse Song #2: God wants our bodies to be strong, our minds to be strong and our hearts to be strong. He knows that when we let Him make us strong, we can live for Him all the days of our lives. The Scripture Lady sings this truth with her Bible verse song called, Heart Free from (Psalm 119:28, 32). Bible Song/Game: “Won’t You Tell Me Now” – One great way to have strong minds is to read the Bible and learn all the great stories and characters of the Bible. Kathy introduces her newest song, Wont You Tell Me Now? This is another Power Point presentation which creatively introduces some of the most beloved Bible characters such as Adam and Eve, Noah, Jacob and Joseph. Teaching Point #3: The third way that God has made us special is by giving us His love. Bible Skit: “The Heart Box” – At this point, Kathy pulls out her “Heart Box.” This “Heart Box” tells who God Loves. One at a time, a child is invited to come to the front and look inside the box to see their reflection and are reminded that Jesus loves them very much. This is always a hit with the little ones!